What changes the current in a circuit? Can you use bulb brightness to measure current? Offset removed by Tare function in software. Be aware that some power supplies are ½ wave rectified producing an average rather than true DC. The Current Sensor will ‘pick up’ the fluctuations in voltage and current from this type of power supply. The Current sensor should be placed in series with the circuit component through which the current is measured. Currents in either direction can be measured. The Current sensors have a very low resistance so that they introduce as little resistance as possible to the circuit. In this investigation the mass lost from a copper electrode is used. Copper is used for convenience, it is readily available in sheet form and can easily be cut into electrodes. Calculate coulombs per faraday. Use a simple water wheel to make electricity via generator. Monitor the voltage and or current over time against other variables e.g. flow, fall height etc. How does the current vary with the number of cells added to the battery? This activity involves pupils thinking in detail about the relationship between brightness and current. It makes use of a Current and Light Level sensor to test a qualitative method of measuring current. Alternative exercise using snapshot to collect data instead of reading values off a meters screen. 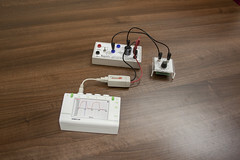 This activity is a standard practical comparing current flow with different materials in a circuit. Strips of different conductors and insulators are provided for the pupils. Conductors are anything that let a current flow. Shows the current in circuit with different resistor values and combinations. Leads to resistor calculations. This activity involves pupils thinking in detail about the relationship between brightness and current. Good opportunity to remind about the difference between voltage and current. Introductory activity to explore the relationship between current and voltage with an ohmic conductor. In this variant changes in voltage and current are measured against time. Introductory activity to explore the relationship between current and voltage with an ohmic conductor. In this variant changes in voltage and current are plotted directly against each other, leading into characteristics of conductors / components. Create voltage current curves for LED, resistor and filament lamp. This worksheet assumes all three curves in one teaching session. 35a and 35b restrict to fewer devices per session. Restricted instructions for voltage current curves for diodes. Collect voltage and current data during a capacitor charge and discharge cycle. Use built in tools to find the energy transferred and stored. This investigation allows the student to calculate the energy stored in the capacitor, it is an extension of the work started in 37 Charge stored on a capacitor. This activity is a useful demonstration of Faraday's experiments into induction. The current produced is small but the combination of the fast logger and software reveals the induced current easily. Uses a single conductor wire. This investigation will allow the students to understand the way the field changes along the axis of a coil. It uses the EASYSENSE software’s Snapshot facility with a function that asks the user for a value (in this case the distance) after each data collection. This investigation is going to study the input characteristics of the transistor across the B–E terminals by applying an alternating voltage, and measuring the voltage across and the current flowing through the B-E junction. This investigation will show the students that, 1. The base voltage controls the collector emitter current. 2. A small change in the base voltage causes a large change in the collector voltage. 3. The use of this change in the collector voltage to provide switching. Amplification of current is also considered. You are going to measure the current through and voltage across the capacitor at different frequencies. From the data, you will calculate the reactance Xc of the capacitor at different frequencies. Investigate how, in a series C-R circuit, resistance and capacitance combine to affect the flow of an ac current. To find the frequency at which the impedance becomes purely resistive - the resonant frequency. Uses LEDs of known frequency and measures the forward voltage for first illumination. A plot of turn on voltage vs wavelength leads to an estimate of the constant. This experiment tries to show why it is that the electricity supply is created as an alternating current (AC).